New Shirt Released and a Secret Sale! We have released a new shirt to start of the month and also have done a little spring cleaning and put up some shirts for a very special sale price. The sale section is not in our usual site but in a place that only our readers or those privileged ones that are signed up for our newsletter can find it. Check it out HERE. Our new shirt : Las Calaveras translated to ( the skulls ) is out now. Be sure to head over to the site and get one before they are all gone. 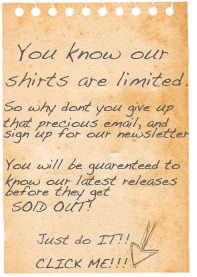 We have alot of cool stuff coming up real soon, so keep checking back and make sure you sign up for the newsletter to get all the latest news and shirt releases (before they get sold out).